Happy House Hostel An Oasis in the heart of Santiago. 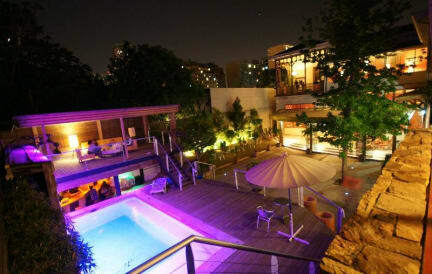 Located in Moneda street in the middle of the historic part of the city and just steps from government palace, main square and the main tourist attractions of Santiago. Happy House Hostel offers a high quality service due to obtaining Q seal of quality and the S seal of sustainability granted by SERNATUR (National Tourism Service of Chile), besides having an impressive infrastructure, facilities, long market experience and strong commitment of their staff to each of its guests. 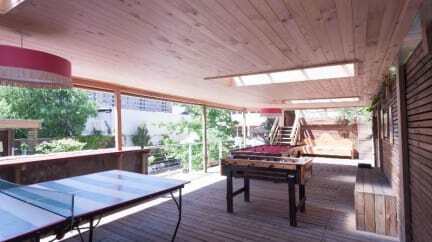 Great hostel, good location, fantastic building and facilities, swimming pool a great addition! Bathrooms could do with a bit of an update and a mirror in the private rooms would be useful but would definitely stay here again! Staff are amazing. So friendly and helpful. Location is perfect. Rooms are cute. Heaters are provided if needed. Common room is large. Breakfast is good! A good hostel in a good location. But most importantly, the staff was incredible, through and through. My flight landed at 5 a.m., and I was at the hostel by 6 a.m. Although my room wasn't ready, they gave me some coffee and held my bag while I hit the city. And throughout my stay, they had the answers to every question about the city, transportation, etc. And one night, they even helped me order a pizza for delivery to the hostel. I don't remember all their names, but Rodrigo was excellent! Very kind and patient staff, luggage room - very helpful when wanting to continue to explore after checkout, very spotty wifi and squeaky floors, but overall a decent place to stay! Stayed at this hostel for 3 nights. The showers on the third floor had little to no pressure. The beds were comfortable and a fan was supplied in the room. The breakfast was quite good. The pool area was the best part about this hostel. It was very nice to relax by the pool and drink a couple of cold beers. The kitchen area was good for cooking meals. The location is close to the subway so you can get to Bella vista relatively quickly. Staff were incredibly helpful - outdoor area is really cool too - overall good hostel biggest downfall was the rundown bathrooms and it was pretty quiet when we were there so lack of atmosphere. The staff was very nice; I can see how this place would amazing in high season. The beautiful high ceilings make this building very loud. I've been in a lot of hostels all over the world and I think this was the noisiest; not that people were being loud and partying, but the walls are very thin so you can hear everything even a couple floors down. Just make sure to bring your ear plugs and I would not suggest wasting your money on a single room - go somewhere else if thats what you need. Great location and the pool is good but average hostel. A bit dirty and strange atmosphere.